One of the first steps in purchasing a new software system is buyer education. When it comes to marketing software, there is some confusion between email marketing and marketing automation software. Many buyers see the two as synonymous, but in reality, the systems are very different, with a varied feature set designed for different types of buyers. 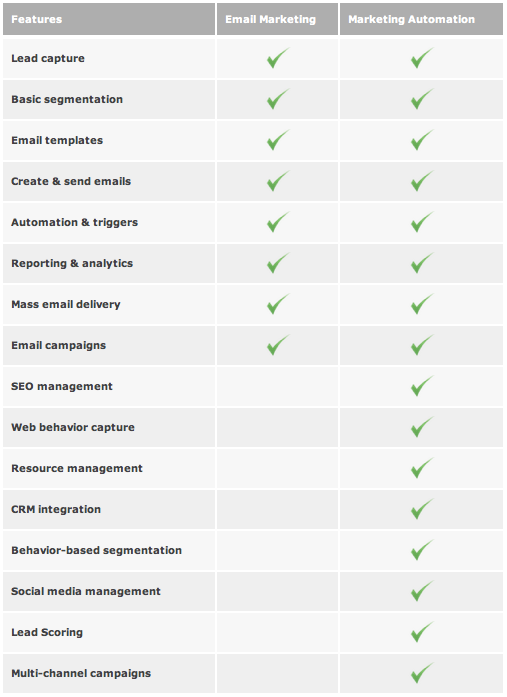 From the feature list comparison, you can see that while there is functional parity in some areas, marketing automation is far more sophisticated. While email marketing systems are designed to track interactions related to email campaigns, marketing automation systems track the chain of interactions across multiple channels and can then make intelligent decisions based on the buyer’s behaviors. Once you understand the features of each system, you have to reflect on your company and it’s needs to see what will work best for you. I suggest examining the three C’s: cost, complexity and content. Cost – Most email marketing systems run around $20/month. Marketing automation is a much larger investment that can range from a several hundred dollars a month to several thousands. However, the investment is worth it if the system is going to help you win more business. Complexity – Companies with limited resources and a fairly homogeneous customer base simply don’t need marketing automation. An email marketing system will provide them with all the tools they need to reach out to clients on a regular basis, promote offers and deals, and attract new business. A company with a less uniform customer base might want to look into marketing automation. Content – Email marketing systems require little in the way of content: create standard templates and refresh them with new content every once in a while. With marketing automation, content is the gas that fuels the engine. A key feature of MA is lead nurturing, which is all about providing targeted messages and communication to a customer to guide them through the buyer cycle. Without strong and consistently delivered content, MA will fail. For the full article, please check out the Software Advice blog. Thanks Lauren. This is a great article that is often pondered by new Marketing Automation practitioners and I appreciate you sharing it here.